Apply for the 10% off student discount! 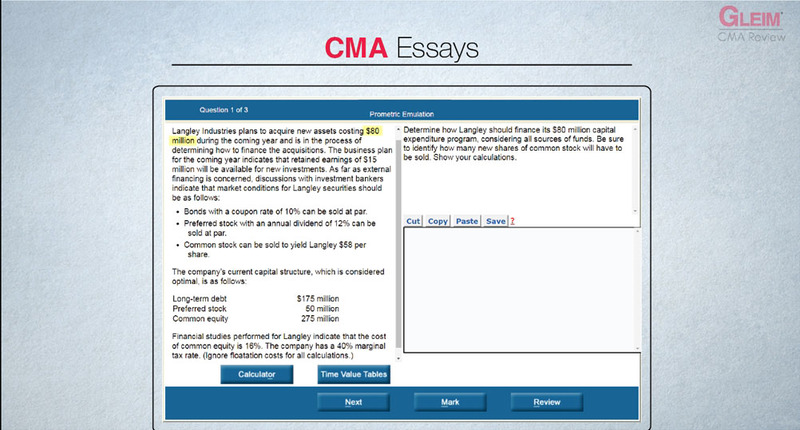 Our test bank of questions and essays is the most realistic collection of sample problems available on the market. Practice using thousands of questions that emulate the exam environment in every way. Get detailed answer explanations for both incorrect and correct answer choices and deepen your understanding of exam material. Our exam-emulating software accurately reflects how the exam looks and feels. You will feel right at home when you sit for your CMA exam at Prometric! 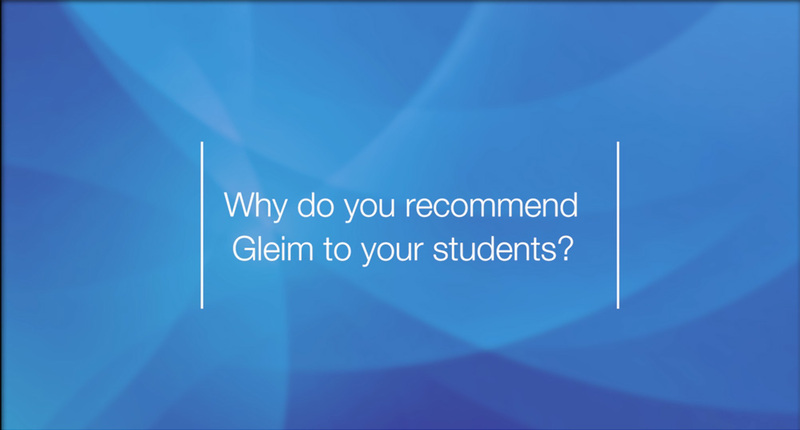 The Gleim Premium Review System integrates all the signature benefits candidates have come to expect from Gleim. You will experience unmatched results with the #1 course that gives you over 40 hours of instructional videos, thousands of exam emulating questions, and unparalleled exam support. You will get all the above features and materials but only for those pertaining to the Part 1 section of the exam. 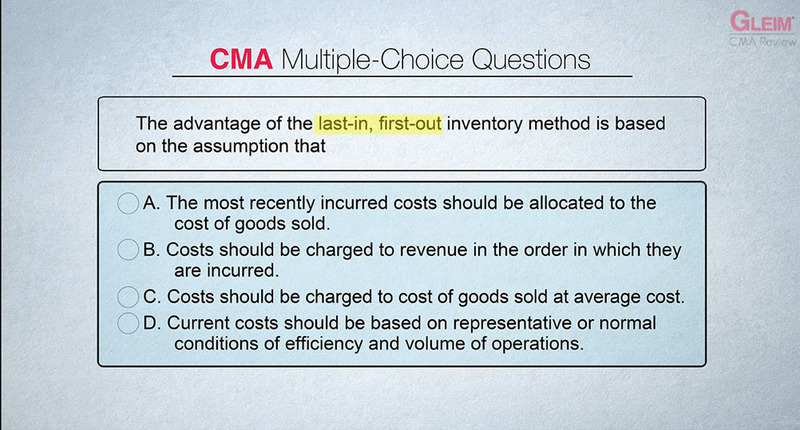 You will get all the above features and materials but only for those pertaining to the Part 2 section of the exam. We GUARANTEE that all components of the Gleim CMA Review will remain current for at least 18 months from your purchase date. If Gleim releases a new edition for any exam section you have purchased but not yet passed within 18 months, you may qualify to receive complimentary replacement books for only the cost of shipping and handling. Your electronic materials will update automatically. See below for conditions and details. Have not sat for or have not passed the exam part(s). Work with you to create a personalized study plan. Make sure that you set the right goals and detail each step to achieve those goals. Provide encouragement, instill confidence, and ensure your success. They are with you every step of the way. Call us toll free at 800.874.5346 ext. 498 or internationally at 352.375.0772 ext. 498. You can also email us at personalcounselor@gleim.com. to verify shipping information and that you are receiving the correct edition. Gleim Publications, Inc., guarantees the immediate refund of all resalable books and unopened, un-downloaded audios returned within 30 days of purchase. Online materials may be canceled within 30 days of purchase if no more than the first study unit has been accessed. Online CPE courses may be canceled within 30 days of adding the course to your Personal Transcript if the Outline has not yet been accessed. This policy applies only to products purchased directly from Gleim Publications, Inc.
No refunds will be provided for opened or downloaded audios, partial returns of package sets, or shipping and handling charges. Any freight charges incurred for returned or refused packages will be the purchaser’s responsibility. For more information regarding the Gleim Return Policy, please contact our offices at (800) 874-5346. Cost of shipping: The cost of shipping will be quoted to you during the checkout process. You can change your order before placing it to see the cost of shipping for different combinations of products. Because of our high volume of shipping, Gleim receives a discounted rate on shipping services. We pass the discount along to our customers, saving you money. Premium SET Purchasers enjoy FREE ground shipping to the contiguous 48 U.S states. Regular shipping within the contiguous 48 United States is USPS Freight charge plus handling.If your U.S. address includes a Post Office Box, you must choose the U.S. Postal Service as your carrier. Other carriers used by Gleim, including UPS, do NOT deliver to PO Boxes within the U.S.; if you choose another carrier, your order will be delayed until Gleim can contact you to provide us with a Street address. Choose the “United States” as your ship-to country. Choose Armed Forces America, Armed Forces Canada, Armed Forces Africa, Armed Forces Europe, Armed Forces Middle East, or Armed Forces Pacific as your state. They are at the bottom of the drop-down list of states on the shipping form. There is an additional freight charge which we pass along to customers within those destinations. Your shipping options and rates will be given to you during the ordering process. Placing your order: You can place your order through our convenient Online Store. It is the fastest, most accurate, reliable and secure way to place your international order with Gleim. Signature authorization required: the Online Store allows you to sign your name electronically with ease and convenience. Orders may also be placed with the assistance of an international consultant, by emailing order requests to international@gleim.com, faxing them to 352.375.6940, or by calling 352.375.0772 ext. 146. Additional charges: the customer is responsible for any additional charges. These may include customs fees, brokerage fees, local taxes, etc. You should check with your local authorities before ordering. Prepayment required: All international orders must be prepaid in full prior to shipment. No CODs. *There is not an International Bank Account Number (IBAN) as these are not required in the U.S.
No returns: Any items shipped outside the U.S. are non-returnable; all freight, shipping & handling costs and customs charges are non-refundable. Unclaimed packages will be abandoned by Gleim Publications and no refunds will be issued. Be sure that your contact information is accurate and up-to-date, and arrange to receive your shipment. U.S. trade embargoes: For an up-to-date list of countries with economic and/or trade sanction embargoes, please visit the Office of Foreign Assets Control (OFAC).Gleim Publications, Inc. adheres to the United States government economic and/or trade sanction embargoes. Thus we cannot ship products or provide services within the countries listed on the OFAC website. We apologize for any inconvenience this may cause you. We process and ship orders daily, within one business day over 98.8% of the time. Orders placed before 4 pm EST usually ship out the same day. You will receive an order confirmation by email when your order is processed. Gleim Publications, Inc. is based in the State of Florida and is required by law to collect the appropriate sales tax for shipments within Florida. This sales tax is calculated for the specific Florida county to which your order is shipped. If your order is shipped to an address outside the state of Florida, Gleim Publications, Inc. will collect no sales tax on your order.